Whether it is by means of employment quota, affirmative action, corporate policies on gender diversity, targeted investment in girls/women STEM education, access to finance or making licensing conditions less onerous for women entrepreneurs and investors, African governments must take concerted measures to increase women’s visibility and participation in the oil and gas sector. 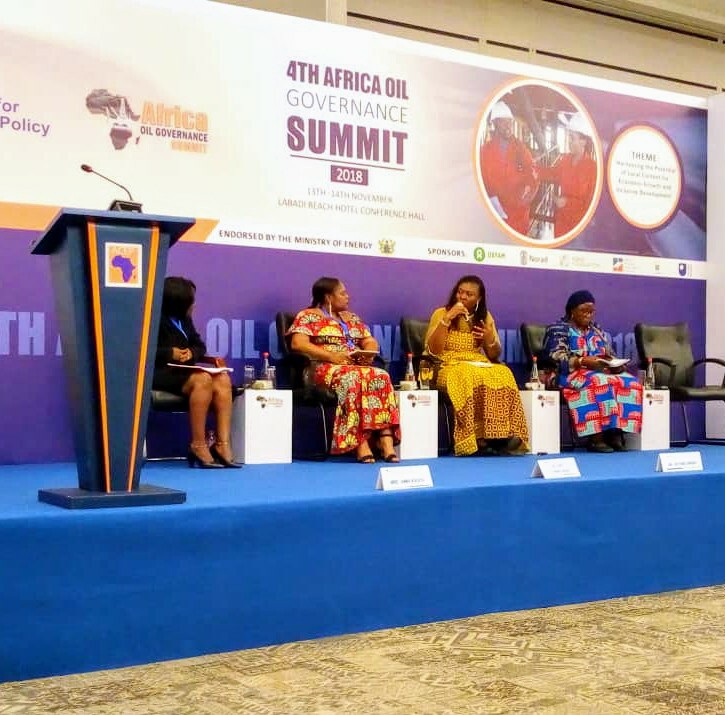 SPACES FOR CHANGE stressed this point at the 4th Africa Oil Governance Summit 2018 during a panel discussing Expanding Opportunities for Women’s Empowerment in the Petroleum Industry. Instituted in 2015, the Africa Oil Governance Summit is an annual event that brings together stakeholders in Africa’s petroleum industry to deliberate on emerging governance issues in the sector. 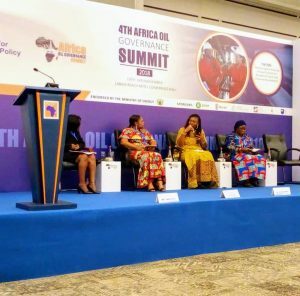 The summit, hosted by the Africa Center for Energy Policy (ACEP), provides a unique platform where stakeholders in Africa’s petroleum industry share best practices on maximizing the benefits of resource extraction through efficient governance approaches. The theme of the 2018 summit is ‘’Harnessing the Potential of Local Content for Economic Growth and Inclusive Development”. The oil industry is still predominantly a Boys Club. Globally, only 20% of the workforce in the oil and gas industry are female. Likewise, women are not advancing enough to leadership roles and contributing to influential decision-making roles in the oil and gas sector. According Pew Research Center’s January 2015 research study, women constitute only 5% of CEOs and 17% of board members across all Fortune 500 companies. Price Waterhouse Cooper’s study of the 100 largest listed oil and gas companies in the world found that women occupy only 11% of seats on the board of directors. Out of the 11%, most of them are in non-executive positions, while only 1% of executive board seats are held by women. Alarmingly too, only a tiny proportion of women sitting on company boards have any executive power. How can this trend be reversed? What can be done to enable more female big players in the big oil business? How do we get more women to the table where decisions affecting the oil and gas sector are made? SPACES FOR CHANGE’s Victoria Ibezim-Ohaeri, Mekombé Thérèse from Oxfam West Africa, Dr. Jemima Nunoo, Board Member of Petroleum Commission, Ghana and Mrs. Anna Kulaya Deputy Country Director, WILDAF Tanzania shared experiences from Nigeria, Ghana, Cameroun, Tanzania, articulating the policy and policy and structural shifts needed in order to close the gender gap in petroleum industry participation, and for strengthening the interface between gender, resource efficiency and environmental sustainability. Local content development policies of resource-rich African countries offer a veritable policy measure for bolstering women’s participation in the petroleum industry. Local content policies typically aim to leverage on the extractive value chain to increase the participation of locals in the oil and gas sector and generate sustained and inclusive growth through economic diversification and employment opportunities. The oil and gas industry offers limited direct employment opportunities to locals due to the sector’s dependence of strong technical skills, foreign technology and infrastructure, and intensive capital requirements. This, coupled with different input requirements, both human and non-human, at various stages of the resource’s extraction, leads to cyclical nature of employment. In most African countries, a wide skills gap exists between local and foreign nationals, making it difficult for extraction companies to employ nationals, particularly in technical roles. Bridging this gap has become a shared priority of African governments. Consequently, many of them have introduced local content legislation to facilitate local value addition and beneficiation. Making local content laws is only a means to an end, but not an end in itself. Legislation is often a double-edged-sword. It can be an enabler and also a restriction. Targets set out in legislation are often not marched with the ability to meet them; e.g. local content benchmarks vs. local capacity available. Local content cannot work without capacity. Will you force companies to take on local content that is not adequately skilled? Legislation will not provide infrastructure needed to equip nationals with the skills need to provide value addition. On the other hand, laws can be restrictive because it narrows the scope of work and activities that can be undertaken in the sector. Within a few years political and economic realities including technological advancements may render laws redundant. Local content presents opportunity for local actors to play some role in the oil and gas sector. It’s not enough to make a legislation demanding local participation. It requires having resources, positioning the local economy. Local content is a solid foundation on which Africa industrialization rests. Industrialization is skills intensive. That means, skills are needed to invent in value–addition. Beyond lawmaking and policy rhetoric, realizing local value addition rests on a country’s political will to build the capacity of its nationals to rise to the industry challenge. Africa must ready to compete. There must be a deliberate policy of supply of local enterprises over time. Is anyone monitoring the outcomes of the different local content projects? There is need to map and track areas the country has gained/developed competitive advantage. Government of Ghana is focused on achieving FPSO integration in local waters, especially between Nigeria and Ghana. Fabrication yards are important, and are needed. Nigeria has been able to build an FPSO, and Ghana needs to leverage on existing capacities in Nigeria. So, some level of cooperation between countries is needed to achieve local content goals because the society is increasingly dynamic and inter-dependent. But the problem with Africans is its very intrinsic tribal disposition. No country ever appoints other skilled Africans to head their institutions, agencies etc. They would rather have their national even if they are less qualified. Again, some Africa countries—like Nigeria—have enacted local content legislation for the oil industry. But across West Africa, some of these laws are at variance with each other. Some harmonization is required. Regional integration enquiries transcending the tribal language and boundary barriers to achieve the capacity gap needed to reposition the oil and gas sector. However, in doing this, certain measures need to be in place to protect the weak in the face of intense competition between unequal actors with varying capabilities. Local content law can also be used to correct gender inequities in employment in the petroleum industry. In Nigeria, the Petroleum Trust Development Fund (PTDF) was established by Decree 25 of 1973 as a parastatal under the Ministry of Petroleum Resources. The Fund was used to subsidize training or education in the field of engineering, geology, science and management in the oil and gas industry. In January 2014, 60 students – 12 girls and 48 boys – received scholarship under the scheme to study oil and gas-related courses at Ostfold University College in Fredrikstad, Norway, revealing a disparity in the male-to-female ratio of PTDF beneficiaries. When more men get technical exposure to the latest technological advancements in the petroleum industry, this significantly limits women’s participation in the industry activities, reducing women’s opportunities to benefit from the sector, and rise to the highest levels of management. This needs some adjustment. Adjusting procedures that entrench gender imbalances in employment are necessary for local content to be meaningful to both women and men. Investment in girls/women education in STEM (Science, Technology, Engineering and Mathematics) is quite an imperative strategy. This sort of capacity building is not event based, but enquires a long time plan. Long termism should override short termism for gender-responsive local content to be materialized. Reform policies respond inadequately to these inequalities. Affirmative action in energy policies is also an empowering strategy that can be used to expand women’s access to boardroom spaces where energy decisions are made, enabling them to overcome the constraints to their participation in decision-making in big businesses and energy-based enterprises. Countries like Rwanda have adopted quota laws to enhance women’s chances to be elected into political office and or be appointed into decision-making positions. The use of quota-based measures can be adopted to confront entrenched structural constraints that inhibit women’s visibility, participation and competitiveness in the energy sector. Are there benefits when women take over? There is evidence that having women in executive positions and on the board can contribute to stronger financial performance and that the better a company is at promoting women, the better it tends to rank in terms of profitability. McKinsey further confirms this when it found that companies with the highest gender diversity teams, as compared to the industry average, see a much higher Return on Equity (10%), a higher operating result (48%), and a stronger stock price growth (70%).